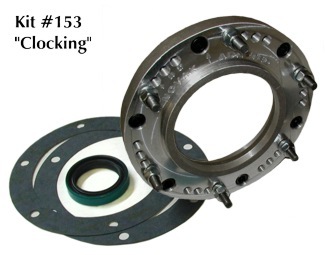 New Process style flange transmissions are adaptable to the Jeep Dana 300 with the use of Novak's #153 clocking ring or #153F flip ring. These transmissions include the 4wd versions of the AX15, AX5, AW4, 904/909, NV3550, and NSG370. 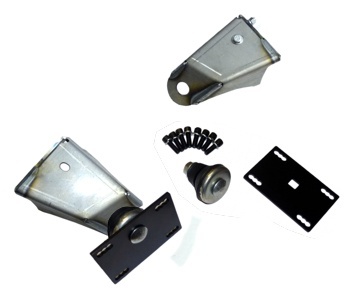 This kit is also compatible with the Jeep NP 208, 219, 228 & 229 transfer cases. 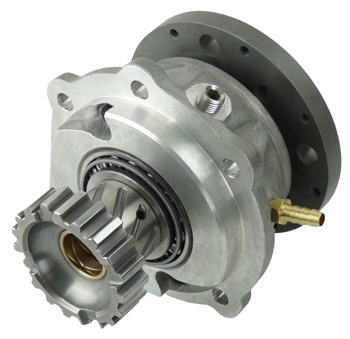 The Novak Jeep Model 300 transfer case adapter is very compact at only 7/8" long. 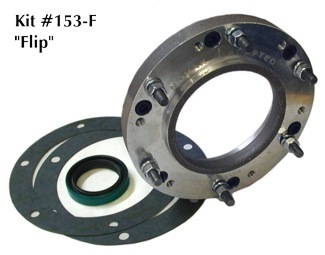 The adapter itself is machined from a billet of 6061T6 alloy, featuring a thick flange and a heavy cross-section. 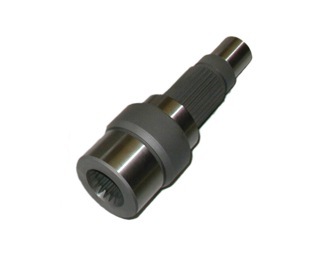 Unlike thin, budget clocking rings, this adapter features precision index centering for longer spline life, instead of relying on bolt locating. Additionally, the Novak #153 features 7/8" of thread engagement, in lieu of an inadequate 3/8”. 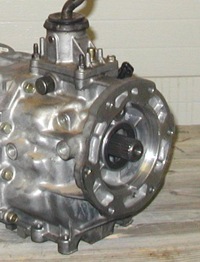 The 153 adapter is drilled and threaded for four transfer case angles while the 153F "Flip" adapter is drilled for two. The installer will be able to easily choose the optimum transfer case angle based on the particular installation. While “flipping” the D300 to a driver drop position is quite simple the ramifications of issues that follow may not be worth the trouble. The shifters will now be pointed down into the ground and likely will interfere with the transmission. Vents are now down, drain and pan up. Rail seals that were designed for light dust and oil retention duty are now immersed in oil and will leak if not seriously addressed. The most successful conversions of this type go to extensive work to relocate the shifters above the transfer case and plug lower holes. The flip ring will do exactly what it is supposed to do but solving the ensuing issues we will leave up to you. Billet adapter housing, special double lip transfer case input shaft seal, transfer case to adapter gasket, transmission to adapter gasket, fastening hardware, and instructions. You may need to add and install an input shaft for your Dana 300. Depending on which transmission you are using. As an example, this AX15 features a 23 spline output shaft that protrudes past the rear face, and therefore, does not require the additional 300 input shaft. If you have a 23 spline transmission output shaft whose end extends ~1/2" past the rear face of the transmission flange, you do not need a new input shaft. If you have a 21 or 23 spline shaft whose end is flush with the rear face of the transmission flange, then add the appropriate 21 or 23 spline input shaft to your order. We’ve seen a handful of shafts broken like this one, and heard our customers speak of more failures of output shafts made by other adapter companies. This is why we go through the trouble and expense of making our output shafts from a solid bar of exceptionally strong 300M alloy steel, instead of lower grade alloys or friction welding salvage GM shafts. A second, sometimes less obvious but pernicious problem is the issue of warpage during friction welding and heat treating - which cannot be corrected when the shaft journals are already ground and worn at or below factory specifications. Novak shafts receive a final hard turn of bearing journals after the heat treat process with special tooling and cooling process to ensure the ultimate finish. The Novak shaft is produced to factory specifications with stress risers removed using much stronger steel alloy. Our 4-axis CNC cut of the spiral gear, oil feed passages and other features are no small tasks. This attention to detail, maximized strength through design and material along with precise tolerances provide the ultimate parts for your project. Jeep New Process 208, 219, 228 & 229 Transfer Cases use the same output shaft style adapters as the Dana 300. Used in 1980 up full sized Jeep applications, they may be retained using these adapters and are fully compatible using the output shaft version. The simpler and more reliable NP208 can be a particularly worthwhile swap. Our usual recommendation is to replace the older style transfer case (especially the troublesome 219, 228 and 229) with a newer, more modern version such as the part-time 231J with HD SYE kit installed and upgrades as appropriate. Also the 242 full-time case (particularly the AMG version as it is extremely strong) has the correct side drop and allows a mechanical speedometer output. Certain part-time Dodge 241 applications will also work. These more modern transfer cases allow the use of our cable shifter assemblies for a cleaner installation, have lower low range ratio, helical cut gearing, fluid pump, and are a newer more refined design. Read more about the differences here. All Jeep models of the Dana 300 transfer cases are compatible with this adapter assembly. IH versions of these transfer cases are not compatible. 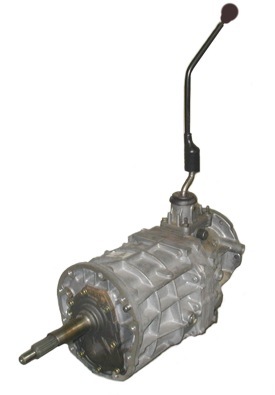 The Dana 300 transfer case is natively stronger than the above gearboxes and will not be the weak link in the chain. The 300 is uncommonly strong, compact and serviceable. They are capable of power ranging up through V6s, V8s and even the Chevy Big Blocks. It is not requisite that you rebuild your transfer case to successfully complete the conversion, but it may be a good time to do so if your transfer case leaks or has many miles of service. 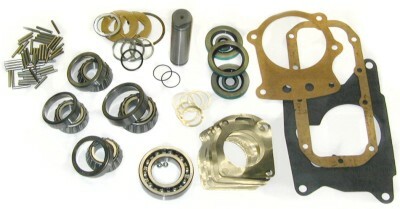 We've made our Dana 300 gaskets & seals kits and our all-inclusive master rebuild kits available for this purpose. This conversion is compatible with all longer wheelbase or stretched Jeeps. Be aware that many of these combinations are simply too long to fit in shorter Jeeps, particularly those with substantial amount of suspension lift. The stock D300 shifter may be used, possibly requiring minor modifications. Often it is advantageous to use a new twin stick style shifter, especially if you are able to remove the interlock pins during the transfer case rebuild process. For the Jeep Dana 300, we recommend two twin stick shifters. One features an adjustable length. Another great option for the D300 is our Dana 300 Transfer Case Twin-Stick Shifter Kit which is a solid, high quality option but lacks the forward adjustability of the transfer case shifters. It has the option of billet knobs showing the engraved shift pattern. If ordered for your particular application, the new Dana 300 input shaft is machined from triple-alloy gear steel. Our 21 and 23 spline versions install easily and quickly, replacing the factory 23 spline input shaft for a direct connection to your transmissions output shaft, as discussed above. 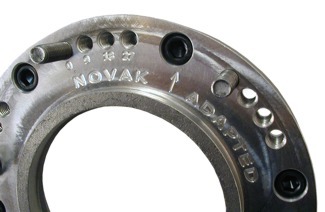 The Novak adapter kit does not use a sealed input shaft bearing. 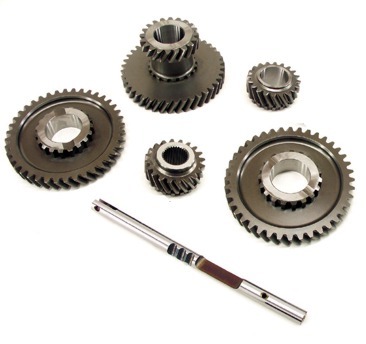 This kit relies on the use of the factory style input shaft bearing, as found in your Dana 300 or in a rebuild kit - in conjunction with a double-sided seal as provided in our adapter kit. We feel it is better to use an open bearing that is continuously flushed and cooled by the transfer case oil. These are brand new units from Aisin and are stronger than any of the original Jeep or Dodge pieces. Originally rated as a Light Duty unit, these carry a Medium Duty rating. They have been successfully used behind LS1, LS2 and the like. With proper care they are extremely strong. Included is our exclusive straight stick that may be bent to the perfect ergonomic location for your application. These rigid and precisely machined billet bottom pans are the answer to a few Dana transfer case dilemmas. 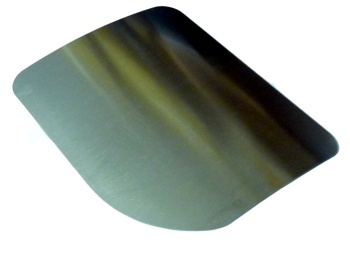 The thick, smooth-finished flange replaces the thin, warped factory pans and they virtually assure a drip-free seal. Two designs are available for the Dana 300: The shallower depth, low-profile version for Jeeps requiring greater ground clearance. 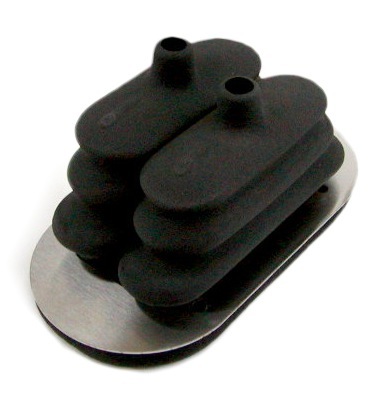 This version increases fluid capacity over the factory pan by about 6 oz. The extended depth version that maximizes the fluid capacity for the most punishing service. This version increases fluid capacity over the factory pan by about 16 oz. If you can accommodate the electronic speedometer or don’t need a speedometer option, this kit will give you the ultimate in strength and short length. Full details are here. The 153 kit requires standard mechanics tools for installation. The D300 input will require bearings be pulled and pressed on the input, in addition to typical mechanic's hand tools. As you assemble the transfer case to the transmission be sure you are not putting forward pressure on the output of the transmission which can cause a multitude of issues, including not shifting properly or even damage to the unit. Use of the factory size driveshaft and yoke is recommended. Our adapter design has maximized clearance between the transmission pan and yoke, but it is necessary that you install your GM engine offset 1-1/4" to the driver's side. If you are installing against a factory AMC engine with our 437 AMC adapter kit, your factory engine should already have this proper offset. Our adapter is drilled for multiple clocking locations from near-factory (20 degrees down) to near-flat (3 degrees down). However, pan clearances and front axle width may inhibit the flatter options. Engine placement in these applications is an effort in compromise to find the best position overall as a package. Generally the engine will be about 1” or even more towards the left, (driver’s side in the USA) away from the front differential in a CJ application. This gives the best balance of weight, and more importantly clearance, for the driveshaft going to the front axle. Your tight spots will be steering to exhaust on the left (hold that as tight as you can) and clearance for the front driveshaft on the right. On a driver’s side drop transfer case, usually the later Jeeps, things often get a little easier as steering and front driveshaft are pushing you the same direction. Fore and aft position will vary with the Jeep model and engine. Have a CJ5 and Gen I with a rear distributor? You’ll be better off a little forward for more rear driveshaft length and clearance for that HEI. If you are in a longer Jeep and using an LS engine with no distributor, you’ll have more fan clearance and better balance if you hold it to the rear. Usually for ground clearance tuck things up nicely for height to avoid damage to oil pans and other life giving parts in the Jeep. On later Jeeps with a Driver’s side drop transfer case and front differential, things are a little easier as the steering and offset are both pushing the drivetrain to the passenger’s side. Again, that 1 to 1-1/2” dimension is usually where you want to be. Common sense and taking a step back to look at things overall goes a long way. If converting to a V8 in conjunction with this upgrade, aftermarket engine mounts are available to ease its installation. Because of the broad spectrum of engines and vehicle combinations used with this adapter, it would be difficult to list them all here. Whatever your application, Novak likely has the perfect solution. From a 225 Buick V6 in a CJ2A to an LS3 in your JK, we’ve got you covered. 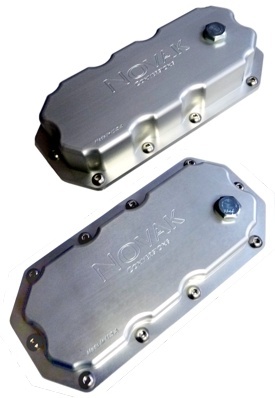 Novak's engine mounts, featuring excellent vibration dampening, superior strength, and impressive adjustability - adjustable even after the engine is installed. The design, strength, and affordability of our mounts are second to none.